I love horses and had two beautiful paint horses. When we moved we sold them and I have some photos of them that are special. Some with my girls riding them and some just capturing their personalities. 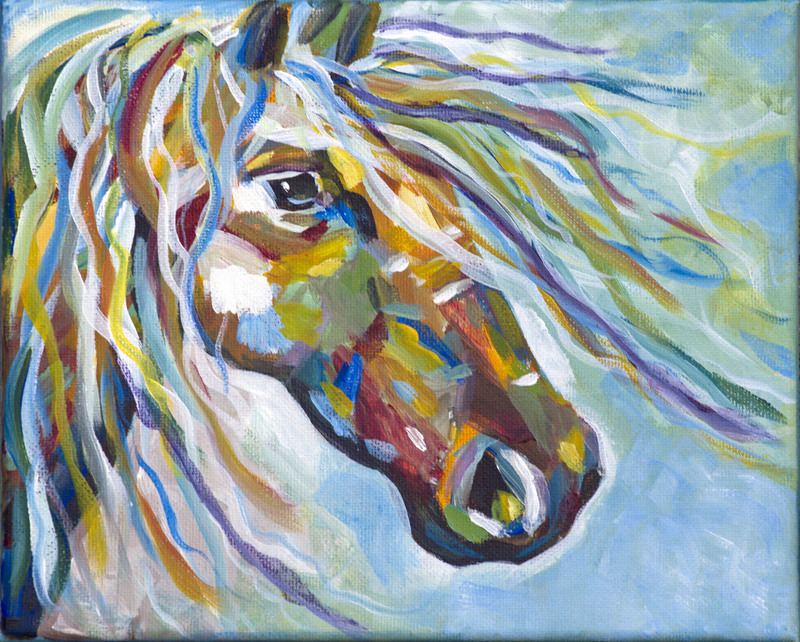 This painting is of Jesse our mare. I imagined reflected color truly making her a painted pony. I have been taking a few oil painting classes and one of the things the instructor said is that there is reflected color in all surfaces. Such as a black dog may have green grass reflected on his shiny coat or a blue sky leaving shades of blue on what appears to be simply a black dog. I learned to look closer and that arbitrary colors can make a painting more interesting. My earliest paintings looked as if I was coloring with paint, something between tole painting and paint by number. I was not happy with the results and studied for a short while with an artist who made me see art differently and woke up my mind to feel the art while I paint. He made a difference. If you are silencing a desire to create art, just start. You won’t be sorry, I’m not. 10 Feb	This entry was published on February 10, 2014 at 12:35 am. It’s filed under Art Cottage and tagged Acrylics, Art, horse, Painting. Bookmark the permalink. Follow any comments here with the RSS feed for this post.